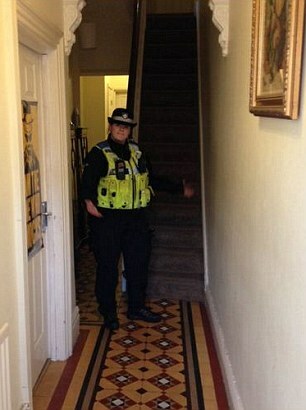 Police in Coventry have been criticised on social media for entering people's unlocked homes and tweeting photos. The Cov City Police team has been on burglary patrol in the city, testing front doors then advising homeowners to lock their properties. The photos, one retweeted by West Midlands Police's chief constable, showed officers inside hallways pointing out the home is insecure. This takes me back. I had an inspector who basically was an arrogant arse and thought he could whatever he liked. He advised us to do this exact same thing while out and about. It was probably around this point where we began to fall out. For a start you have no idea who's house you are walking into or what you might find inside. A second point would be peoples right to family life. A third point would be unwarranted entry into a private dwelling. A fourth would be undue stress and no doubt shock of the lawful occupants upon discovering a total stranger in their home. I should imagine this would a decent defense of said occupant should an officer end up being assaulted inthe course of unlawfully entering someone's home. 7133 wrote: This takes me back. I had an inspector who basically was an arrogant arse and thought he could whatever he liked. He advised us to do this exact same thing while out and about. We sort of did this. But, what we actually did was just test door handles. Doors that were unlocked, we would remain outside, and knock on. Explain what we were doing etc. Combined we did several hundred properties, not a single complaint because we respected the boundaries. testing the handles is one thing, but we were told to walk right in. No way! One amusing thing was that we used to put these hand leaflets through open doors and windows. I put one through a window once and it fluttered down inside and somehow right across the room to drift under the sofa like a feather. It might have been weeks, months or years before the occupants found it.